Both Friday and Saturday evening were very clear, and the moon not yet a nuisance untill midnight. 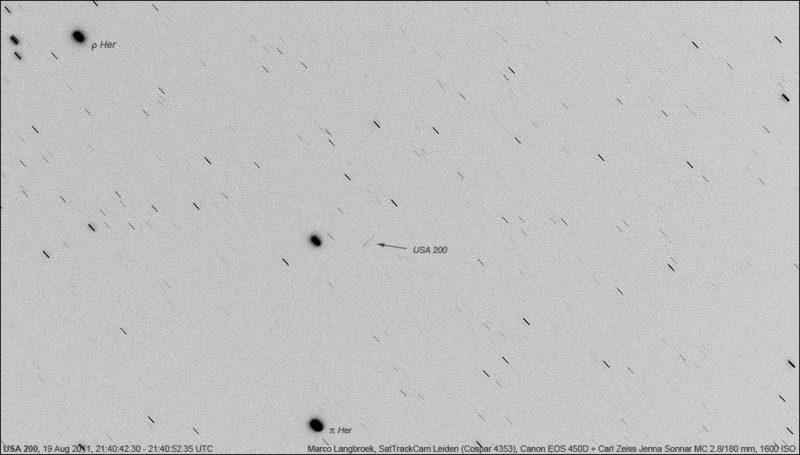 On Friday I targetted both a few LEO and HEO objects. The KH-12 Keyhole USA 129 (96-072A), the SAR Lacrosse 3 (97-064A) and the FIA Radar 1 (10-046A) were observed, although a misalignment of the camera in the case of FIA R1 resulted in only one point on the latter. 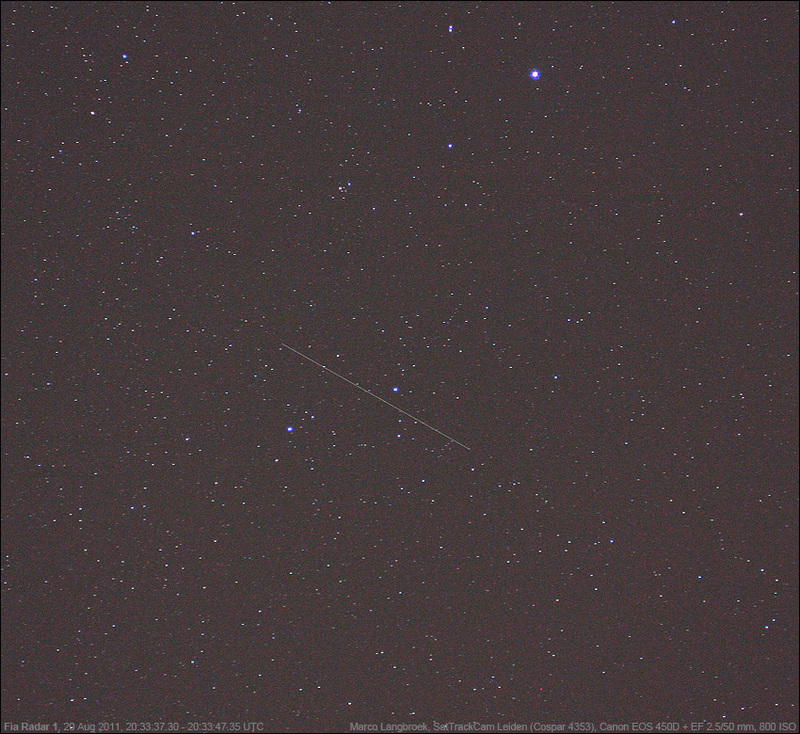 As I was waiting for FIA R1 to pass, the International Space Station (ISS) made a majestic, very bright zenith pass. Next I changed the EF 2.5/50mm lens for the Carl Zeiss Jena Sonnar MC 2.8/180mm, and targetted two faint and distant HEO objects, The Trumpet ELINT and SBIRS platform USA 200 (08-010A) and the SDS 3-4 data communications satellite USA 179 (04-034A). Two images of both are shown below. 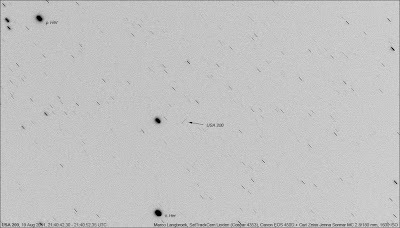 While sleeping, the G68 Sierra Stars Observatory Telescope in California made images for me that resulted in a position on the enigmatic Prowler (90-097E). 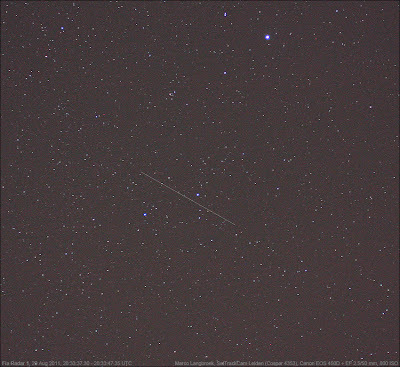 Saturday evening was clear as well. This time, I only targetted LEO objects: the Japanese malfunctioned satellite IGS 1B (03-009B), and both the KH-12 USA 129 and the FIA Radar 1 again. As I was observing, a group of people attending a birthday party of one of the neighbours came onto the courtyard for a smoke. Curious, they asked me what I was doing, and after a short explanation from my part, the group of six watched in an excited state when IGS 1B made a very bright pass. It was easily visible naked eye, and they all saw it. 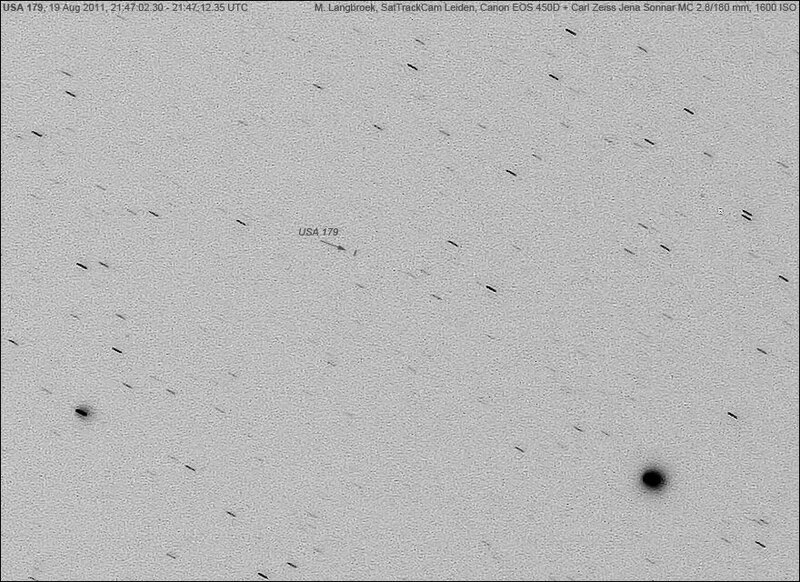 Below is one of the images from this evening: the FIA Radar 1 (10-046A) passing through Lyra (brightest star is Vega).